Photo credit: http://www.english.yonhapnews.co.kr. Daegu’s new baseball park is a stunningly beautiful structure with seats facing towards home base. What is it? 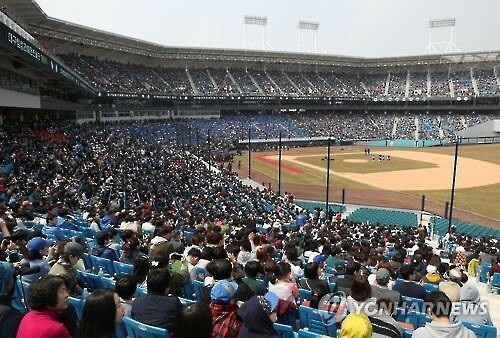 Daegu Samsung Lions Park is the newest baseball stadium in Korea. It is located in the eastern outskirts of Daegu Metropolitan City, and was opened in 2016. It has a capacity of 26,000 and, as the name suggests, is the home of the Samsung Lions. It is a very beautiful stadium with modern amenities and provides fans a great baseball experience. How can I get there? Although the stadium is outside of the main part of Daegu city, it is quite simple to get there. Just hop on the 2 line (green) and head to Daekongwon Station (대공원역). From there just pop out of either exit 4 or 5, and you will find yourself right next to the stadium. If you prefer the bus then a ton of buses will take you to Daekongwon Station, Exit 5 (대공원(5번출구)) bus stop, which is right next to the stadium. Can I buy food and drink? As a new stadium Lions Park offers you several food options. Head down to ‘Food Street’, on the third base side, and you can find chicken, pizza, and many other good options. As you’d come to expect, there are also many convenience stores where you can buy beer, snacks, and other drinks. As a KBO stadium, however, there are some limitations as to what can be brought into the stadium from the outside. What if I want to buy some merchandise? If you decide to become a supporter of the Lions, or just want a souvenir, head down to the fan shop located by the main entrance. There you will be able to get a hold of Lions jerseys, hats, accessories, and more. But as you have probably come to expect, only the home team’s merchandise is available. Where should I sit? Although they have seen a massive drop in performance this year, Samsung recently had a run of four championship wins in a row. This has meant that the Lions are one of the most popular teams in Korea. So if you want to get in on the home fan action, get yourself a ticket on the lower level on the third base side. For big games you might see a decent amount of away fans on the first base side, but in general it’s a good option if the home side is sold-out. The upper deck, gives you a great view of the action, and of the natural scenery behind the stadium. Lastly, the outfield seating gives you a great look back in on the stadium, but can otherwise be a little removed from the action. Is there any post-game entertainment? Only if you are a fan of nature. Due to the remote location of the stadium, there is very little outside of the stadium. If you like hiking, there are a few trails nearby and a small reservoir (연호지) that might provide a relaxing break from the city. However, if you are feeling some post-game drinks or food, it is back on the subway and back into the city. Oh, I need a ticket. Can I get one? Thanks to the new stadium, and increased capacity, getting a ticket is much easier than in the past. While the lower level, third base side tickets are sure to go quick, it should be fairly easy to get tickets for the other areas. Tickets are available at the main entrance, where you would come in from the subway and bus stop, and as usual online. If you want to get in of the intense fan action, be sure to book the home side tickets early. Next postGrandslamKBO podcast. Episode 3.